This week, I'd like to share some powerful web resources that use the increasing amount of primary source materials online and have the power to engage students using digital tools and their desire to express themselves. As an educator who believes in teaching students to honor intellectual property, I'm always looking for sites that include materials students can use to create multimedia projects. Fair use guidelines gives us some flexibility in using multimedia inside our classroom. But in the world of Web 2.0, the audience for these media projects has expanded outside our classroom, with more and more interest in publishing for an authentic global audiences. All one has to do is look at the popularity of You Tube and other video sharing sites to know that young people are highly motivated to express themselves to audiences outside the classroom. Thanks to the Creative Commons license, more and more materials are available online that students can use to create and publish their multimedia productions for a global audience. This week, I'd like to share 5 sites that go one step further than Creative Commons materials. These sites host primary source materials and encourage young people to use them to produce and publish their own creations. Some even include online tools to help students with the process. This site was created by a voter registration organization who wanted to keep the young people they registered involved and engaged . To do this, they provided them with free online tools and raw materials through “America Now” and “America Then” playlists. Remix America encourages students to draw parallels between the present and the past. They hope that viewing seminal speeches and events from American History will inspire young people to express themselves and take action on the issues that matter to them. Teachers around America have stumbled across Remix America and incorporated the materials in their classroom. One teacher asked her students to take a quote from Shakespeare’s Julius Caesar and apply it to the 2008 election. Another asked her students to create PSAs on the issues that matter most to them – censorship, war, civil rights. You can browse through “Favorite Remixes” section to see some of these great remixes! NASA has done something similar to engage students in science, technology, engineering and mathematics. The NASA's Do-It-Yourself Podcast activity provides students with audio clips, video, and photos related to space. Students can use the NASA materials to produce their own audio or video productions. PrimaryAccess is a web-based tool that offers teachers and students access to digital images and other materials that enable them to construct movies using tools provided by the web site. Although many of the primary source materials are photograph and still images, the tools provided on the website allows students to add motions to create a movie effect. I first learned about Primary Access while listening to Glen Bull's presentation during the 2008 K-12 online conference. This website is not yet populated with lots of materials, but has promise in offering students free, educational, copyright-friendly media resources. According to the project website “Students and teachers around the world can access pre-made collections, or "kits," of various digital assets - still images, background music, narratives, video and text. Each kit is built around a common theme, or curricular topic. For students, this becomes the construction paper of the 21st century --allowing them to create reports and projects filled with rich, immersive media for communicating their vision of whatever subjects they chose. AS they master the technology, they will progress from building projects with supplied materials to projects where they find or create their own resources -- a strategy that results in truly authentic assessment as measured by the projects produced." Have you discovered similar collection of primary source raw materials and tools that encourage students to create and express themselves? I'd love to find more of these. This week, it's my turn to come up with a thoughtful list of resources for teachers, and I have chosen the theme of 21st Century Skills. Recently, in the main stream press and in the edublogger/eduTwitter world, there has been debate about the validity of such a skill set. This particular blog post will not do justice to this ongoing argument, but I do have one observation to add. I recently had the amazing opportunity to travel to Singapore to visit schools and assist with the 2008 Apple Distinguished Educator Asia Institute. A more comprehensive blog post about my experiences will follow one day (I'm still mulling over everything I experienced), but I was really struck by the attitudes of the people I encountered. It seemed to me, from my conversations with administrators and teachers from Singaporean and international schools, that many agreed with the basic idea that students and teachers today are require to employ a different mindset and set of abilities in this changing world. There was no ongoing debate; it was accepted that education had to change in light of this, and that this change happened through collaboration and exploration of global best practices. In my opinion, U.S educators need to stop arguing semantics on this topic and need to get down to the business of educating our peers about teaching and learning in the 21st century. Here we are, nearly 10 years into this new millennium, poised to start making meaningful, substantive change happen. Let's get on with it, people! We've got hard work to do! 6) The Metiri Group: What's So Different About the 21st Century? Feel free to offer any other recommendations in the comments here! My "Future of Education" interview series is moving forward in full swing now, and you can see the details at FutureofEducation.com. Tomorrow (Wednesday, February 11, 2009) I interview Julie Evans, the CEO of Project Tomorrow, a national education nonprofit organization (formerly known as NetDay), about what has been learned from Speak Up, the annual national research project facilitated by Project Tomorrow. The Speak Up data represents the largest collection of authentic, unfiltered stakeholder input on education, technology, 21st century skills, schools of the future and science instruction. Education, business, and policy leaders report using the data regularly to inform federal, state, and local education programs. A copy of the "top ten" report is attached to the discussion page at the discussion page at Future of Education. Join me for the interview and a Q & A session--details at the bottom of this post. And we're just getting started... :) Recordings of previous events with Tom Friedman, DonTapscott, and Carol Broos are also available on the Future of Education site. Hope you'll consider joining our conversations! Location: In Elluminate. Log in at https://sas.elluminate.com/m.jnlp?password=M.05AE98D09503B33735A7E36EC6A874 The Elluminate room will be open up to 30 minutes before the event if you want to come in early. To make sure that your computer is configured for Elluminate, please visithttp://www.elluminate.com/support. The interview will be recorded and the recordings placed in the discussion page at Future of Education linked above. Earlier this school year, I decided to follow in the footsteps of fellow educator, Lucy Gray, by posting a weekly list of websites, called the Friday Five, within my school. Lucy started the Friday Five tradition on her website back in 2006. This list has turned out to be one the most successful professional development methods I've tried this year. It seems like in a world where we are overwhelmed by choice, "more" is not always better. Just ask Barry Schwartz, author of Paradox of Choice. In a world, where the cookie aisle at your store has 285 types of cookies and Google yields millions of results for most queries, educators are welcoming a "short" list of websites related to a theme. Therefore, Lucy and I have decided to pool our efforts to bring this Friday Five feature to the readers of Infinite Thinking Machine. We hope you will enjoy a 'short' list of five or so websites around a topic or theme related to using technology to help you shape your students into Infinite Thinking Machines. This week's list comes on the heel of the Horizon 2009 report's predictions, and includes links ranging from broad predictions of the role of cellphones in our future, ways to use them in education, and reminders of the need for increased discussions about safety around their use. An accompanying web site focusing these issues on education is1. the more recent riskier behaviors related to cell phones. I hope this collection of sites is useful to those of you currently discussing cellphone use in your school community. And Lucy and I look forward to bringing you next week's Friday Five. Feel free to offer your own related websites in the comments, or suggest some topics for future Friday Fives. As part of their Emerging Technologies Initiative, the New Media Consortium annually publishes a document entitled the Horizon Report, which addresses new technologies and associated trends and challenges related to learning institutions. The production of this report is led by NMC staff with assistance from an advisory board. Recently, the NMC has branched into creating specialized reports such as this one addressing the implications of emerging technologies for education in Australia and New Zealand. Currently, work is underway on a K12 global edition of the Horizon Report. Last week, I had the privilege and pleasure of attending the first advisory board meeting for this particular K12 venture in Dallas, Texas. Advisory board members hailed from around the world and work in various capacities for a variety of organizations. Some work for corporations and non-profits; others were employed by elementary, secondary, and higher education institutions. While much of the preliminary work for the K12 report is completed online through the use of a wiki, this face to face meeting facilitated a remarkable process for digging into the project. NMC documentation refers to this method as a modified Delphi process. (Incidentally, I was able to get a better grasp on the goals of the Horizon Report from this real time meeting, adding evidence to my personal belief that face to face interactions are not completely disappearing from the way we work). What do you see as the key challenges related to teaching, learning, or creative expression that learning-focused institutions will face during the next 5 years? Advisory board members not present in Dallas contributed their expertise on the wiki and at our Dallas meeting, members attending added to this collection of knowledge. We vetted trends and challenges, and finally established the emerging technologies that we believe schools should adopt immediately, those that they should be looking to adopt in the two to three year range, and those that worth keeping in mind in terms of long range planning. This process was seamless and resulted a group consensus on these various topics. In general, I felt that we kept to our agenda for the day and produced tangible results by the end of meeting. Underlying our work was the amazing graphic facilitation by NMC Vice President Rachel Smith. Rachel has a background in art education and she gave further meaning to our discussions by translating information into a graphical format. A large sheet of paper served as a whiteboard for illustrating our introductions and Rachel also transcribed trends, challenges, and technologies already logged in the wiki on to other sheets. These images really engaged us, helped refine our thinking, and will serve as an archive to which we can look back and reflect. This technique served to bridge the virtual work in the wiki (and advisory board members not present) with the face to face meeting agenda. Graphic facilitation is a field that previously has been unknown to me and I thought it was a very powerful way of gathering information, guiding the decision making process and for reinforcing learning for participants. Rachel mentioned that these facilitators are not just used for meeting work, but also in conjunction with keynote speakers. 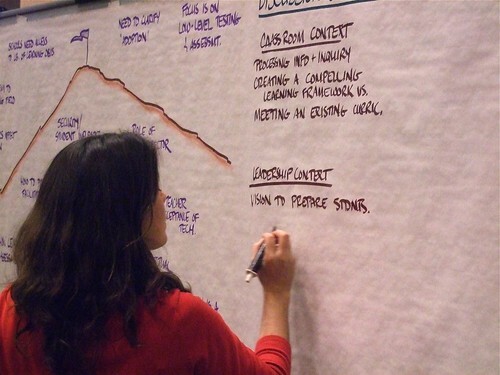 For more information on graphic facilitation, check out the Center for Graphic Facilitation and the International Forum for Visual Practitioners website. The work for the K12 Horizon report will continue over the next few weeks with further refinements to the short list of new and emerging technologies. NMC CEO Larry Johnson, CTO Alan Levine and Vice President Rachel Smith will also be engaged with the research and writing of the final report scheduled for release at the annual Consortium for School Networking conference March 10 -12 in Austin, Texas. Also, I will be a guest on the Seedlings podcast to talk about the work of the advisory board sometime in March. It is my hope that this practical document will serve as a catalyst for K12 educational institutions to examine their own practices related to technology and to plan for the future. Now is the time to get ahead of new technologies; we must align ourselves with changes in the way the world works and communicates. For more information on the New Media Consortium, visit them at http://www.nmc.orge. See also information on the Horizon Project and check out their YouTube channel, their photos in Flickr, and their twitter channel!